Today, we are going to discuss about one of the more vibrant models from the De’Longhi line of products. De’Longhi, if you are not familiar with it, is one of those lines of products that happens to make products that tend to stand out from the other products because of their perfect harmony. As in, De’Longhi seems to give you the perfect combination of the several factors such as aestheticism, functionality and everything all the way up to affordability. Now, as I said earlier, this model is one of the more vibrant models from De’Longhi line of products. If you happen to walk into a store and Nespresso models are on display, this might just happen to be one of the first ones to catch your eye, and as such is likely to be at least present on your list of preferred models, if not on the top of it. In today’s article we are going to take a look at the several aspects of this model and we are also going to take a look at what people who have had the chance to use it have to say about it- both the positive and negative sides, naturally. Finally, we are also going to check out which other models might interest you if you’re interested in this one and you might want to check out if you want something different, so we hope that you read the article till the end and don’t forget to check out Gamble Bay Coffee for more of such articles! What are the main features of the De’Longhi Nespresso Expert Espresso Machine? To begin with, this machine offers you one of the most aesthetic outlooks that any Nespresso Machine can ever provide you with. Almost everyone agrees on the fact that it’s one of the most elegant machines that’s bound to make your Kitchen more beautiful regardless of what kind of a kitchen you have. This huge aesthetic advantage alone has made several people love this model so much that they even forget to consider the alternatives available! So, when counting the features of this model, the looks play a really important part for this model. Even in terms of versatility and functionality, this model is really advanced. While several other models such as De’Longhi Inissia provide you with only two cup sizes, this one provides you with four of them! You are free to choose between americano, Espresso, Lungo, and Ristretto just as you please and this makes this model really much better than several other models. This model also boasts of a hot water function, which makes this model a special one. The special spout for making americano preparations and other things like that gives this model a really upper hand when it comes to the functionality level! And just like all other models, this model can also heat up really soon and as such you can expect it to be ready in as early as 30 seconds! Yes, you heard me right, in just 30 seconds, the machine is ready with hot water to cater to your needs! You have been given a large amount of functionality and option here as well, where you can choose between three heating levels of medium, hot and extra hot! So, you can choose exactly the kind of temperature that you want in this model, this gives you a real advantage because now you can prepare your drink in the exact way that you want to so that you can ensure that you can get the real taste out of it that you’re looking for! And this model is even more awesome because it has the intuitive LED alerts that we all just crave for now in this era of digitization and automation! Just imagine, if you had to be standing there all the time and having to guess when it was going to be ready, would that make it any better than the medieval contraptions? No, right? Well, you can rest assured that we have moved onward with at least technology because the right LED tells you which step you’re at right now, a truly amazing feature that lessens your burden of waiting and guesswork! And the best part is that you can have all of these features connected right to your phone to operate at the touch of a button! Yes, you heard me right! This machine also has the bluetooth feature that ensures that this machine actually gives you the highest levels of functionality and automation to reduce your involvement to a bare minimum! Considering all of these aspects, if we take a look at the price of the machine, we imagine it to be quite a few times as much as the other models available. While it sure is a little more expensive, it sure is not as expensive as we thought it could have been, and that’s a really great thing. While we still cannot call this machine the most affordable one available out there, we can surely call it affordable judging from the perspective of all that it offers you with. What are some of the negative factors about the De’Longhi Expert Espresso Machine? While this machine might seem flawless at the first glance, that doesn’t really mean it really is flawless. While it certainly is a really great model that is really loved, it still has a few minor limitations that you must know about before you make up your mind to buy it and proceed with the choice. This is really important because this ensures that you would be able to make it fit in perfectly with your needs. This model is a little too large. While this certainly does add to the aesthetic factor because of how perfectly it is laid out, some people seem to have problems putting it properly on the counter-top and that is one of the main issues that this model faces. If you’re looking for a really handy model, you might want to take a look at some of the comparatively more size-efficient models. Next thing is that this model doesn’t have the Milk Frother part. Some people really aim for it and as such it’s one of those things that might make some people consider alternatives. So, if you’re looking for that in your model, you might want to take a look at the other models. 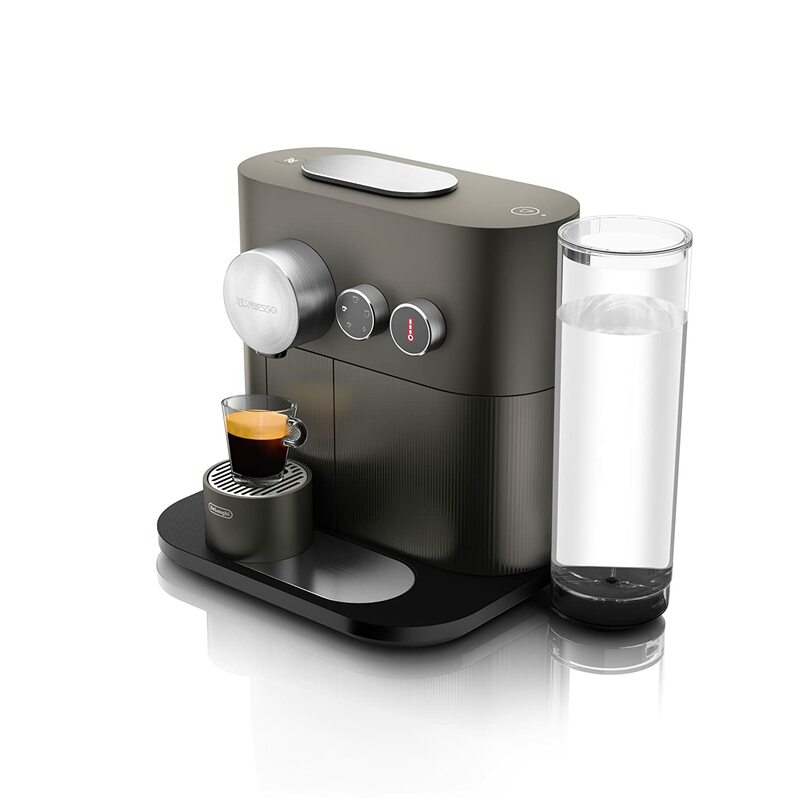 The main model to consider, according to me, in such a case, would be the Breville Nespresso Essenza Mini Espresso Machine, because this model gives you not only that, but also a lot of functionalities that any true coffee or espresso lover is bound to love from the bottom of their heart! This model is a little less versatile in comparison to the other models because you will only have to buy from Nestle. That’s one of the things Nestle has taken care of and so you’re pretty much forced to abide by that. While their coffee is undoubtedly nice, that’s one of the things that several people don’t seem to like and so seems proper to mention here, so that you can judge it based on your look on this. Finally, while affordable according to its features, this model is still a little more expensive than some of the other Nespresso machines that are available out there, so that is one more thing that you must keep in mind if you’re on a comparatively conservative budget. Choosing the right model is something that a lot of people face troubles with. I believe that this is because they do not really understand how to properly judge models. The first thing that one must do is understand what they are actually looking for. Once you know what you are looking for, it becomes surprisingly easy to judge models based on your needs. And your specific needs guide you towards the model that is perfect for you. Know that the bestselling model isn’t always importantly the best one for you. The best model for you is the model that serves all your needs at the most affordable price. As long as you keep this in the back of your mind, you will be able to judge the models according to your needs and choose the perfect one for yourself. Just remember not to worry too much and not to stop thinking when the time to act comes. It’s really simply and choosing the right model is the best way to ensure that all your needs will be served. So, are you ready to go shopping for the right model for yourself? This model has already been loved by those that have had the chance to use it and so it might not come as anything new, but I really think this model is worth going for if it fits in with all your needs and you can adjust to the size of it. The main reason is because that this model, while a little more expensive than some others, provides you with just so many features that it’s pretty much bound to turn out to be the right model from you from all the perspectives! Of course, if you’re looking for something in specific like the Frother, then you might still have to choose something else. But except that, this model really seems like a pretty much ideal model. After thinking over all of these, I feel convinced that this model is actually a really great model with very limited flaws. It seems like if you are judicious when buying it and buy it only if it fits your needs, it’s a great model if it suits you, and that certainly has gone a long way into making this model one of the top sellers in this category of products. So, at the end of the day, I can say that this product is really recommended if it serves all your needs. So, I would really recommend going for this model if it serves all your needs and even more so if you happen to stumble upon it when it’s on a good sale, don’t even think about missing the opportunity then! Alternative Choices: What Else Can I Look At? You know the market is really tight when even models as awesome as this one face stiff competition. Yes, you heard me right, even this model has really close competitors and people get really confused as to which one they should go for. But that’s all the more reason to know about them and even check them out because if this one doesn’t exactly fit your needs, one of them just might! Nespresso Essenza Mini Espresso Machine by Breville: This is the Nespresso Essenza Mini Espresso Machine from the Breville line of products, a line known for its unique products that provide with a really high level of functionality. Nespresso Inissia Espresso Machine by De’Longhi: De’Longhi, one of the most loved brands out there, brings to you the Nespresso Inissia Espresso Machine to cater to this love of yours for the perfect Espresso! This is naturally one of the main competitors for the Breville Essenza Mini Espresso Machine. Nespresso Vertuo Coffee and Espresso Machine by Breville: And finally, the Nespresso Vertuo Coffee and Espresso Machine, also from the famous Breville line of products (famous for their functionality, as I just stated) is yet another competitor for the Nespresso Inissia Espresso Machine from the De’Longhi line of products.